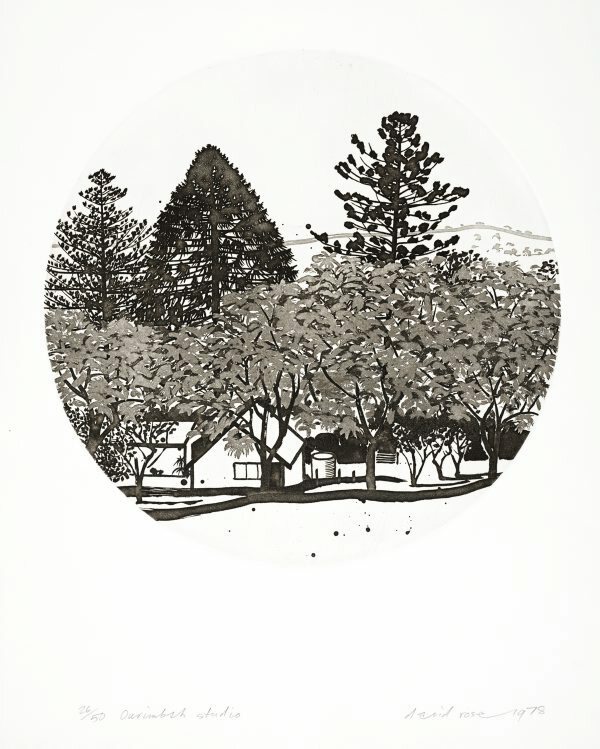 Rose was born in Melbourne and began painting and printmaking in 1960, first making the screenprints for which he is best known, in 1961. In 1964-65 he travelled in Europe and studied etching at Escuela Lonja in Barcelona; he also produced a series of lithographs at a local commercial lithographers workshop. From 1967-76 he taught printmaking at East Sydney Technical College, leaving to pursue his own work full-time from 1977-86. Rose taught at the City Art Institute, Sydney from 1986-90. From 1976-2006 he lived and worked in Ourimbah NSW, the subject of this etching. Signed and dated l.r., pencil "david rose 1978".